Indian External Affairs Minister Sushma Swaraj raised the issue with her Chinese counterpart Wang Yi of imposing UN Security Council sanctions against the Kashmir-based militant Masood Azhar, the leader of Islamist group Jaish-e-Mohammed, calling on Beijing to cooperate, the ministry’s spokesman said Monday. 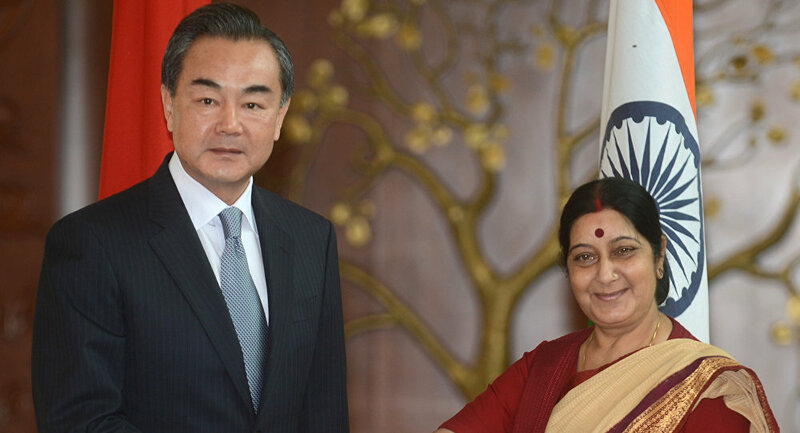 NEW DELHI (Sputnik) — Swaraj and Wang held a bilateral meeting earlier in the day on the sidelines of the 14th trilateral summit in the Russia, India and China (RIC) format. "Indian External Affairs Minister raised the issue of listing of Masood Azhar in the UN 1267 Committee and emphasized that as common victims of terrorism, China and India should cooperate in combating this challenge. It was agreed that the two sides would remain in touch on this matter," spokesman Vikas Swarup said in a statement following the meeting. Azhar is the founder and leader of Jaish-e-Mohammed, an Islamist group based in the Pakistani-controlled part of Kashmir, a region disputed between Pakistan, India and China. India has designated Azhar as a terrorist, while China used its UN Security Council veto power to block India's UN Security Council sanctioning bid against the militant. Azhar has served time in an Indian prison for his participation in a terrorist group, but was freed in exchange for the release of hostages on a hijacked India Airlines passenger plane in 1999. He is the main suspect in organizing an attack on the Indian parliament in 2001 that killed eight police and security officers, five militants and a gardener.